Heading off on holiday this summer? Don't forget your sunnies. That's the advice from researchers who say sunbathers generally forget to apply sun cream to key areas of their face. The University of Liverpool team urges holidaymakers to wear sunglasses to help protect against skin cancer. As well as packing your sunnies, don't forget to arrange travel insurance before jetting off. Some 57 people were asked to apply sun cream just as they would normally. Testing with a UV sensitive camera found 3 in 4 people missed the area between the inner corner of the eye and the bridge of the nose. Overall, participants missed 9.5% of the whole face when applying the sun cream. The eyelids were another area missed by many people. 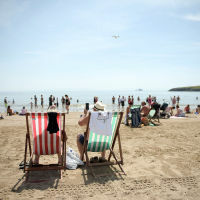 Dr Kevin Hamill of the University of Liverpool, said: "It's worrying that people find it so hard to sufficiently apply sunscreen to their face, an area which is particularly at risk of skin cancer due to the amount of sun exposure it receives. "Perhaps the most important thing to take away from this research is the importance of sunglasses. "Most people consider the point of sunglasses is to protect the eyes, specifically corneas, from UV damage, and to make it easier to see in bright sunlight. "However, they do more than that - they protect the highly cancer-prone eyelid skin as well." The findings were presented at the British Association of Dermatologists' annual conference.